The Green Bay Packers failed their first road test of the season Sunday in our nation’s capital, as the Washington Redskins handled the Packers 31-17 in week three. Adrian Peterson gashed the Packers for 120 yards on 19 carries, including two touchdowns. Jordan Reed and Vernon Davis combined for six catches for 135 yards. Alex Smith racked up 214 passing yards in the first half. From the box score to the rainy conditions, it was a sloppy day for the Packers. After three weeks of the season, the Packers are 1-1-1 overall. The team is still searching for its identity, and so is the fan base. The Good Stuff: RB Aaron Jones & WR Geronimo Allison. Aaron Jones looked good, as he does every time he suits up. Coming off a two-game suspension, Jones led the Packers with six carries for 42 rushing yards. There’s nothing wrong with 7.0 yards-per-carry, but unfortunately, he only got six of them … Also, Geronimo Allison showed up again. With a 64-yard touchdown, G-Mo finished with two catches for 78 yards. Through three games, Allison is on pace for 69 catches, 1,114 yards and 10 touchdowns. He continues to impress. The Packers’ pass defense picked up where it left off last week against the Minnesota Vikings when Kirk Cousins carved them up for 141 yards after the Clay Matthews call. 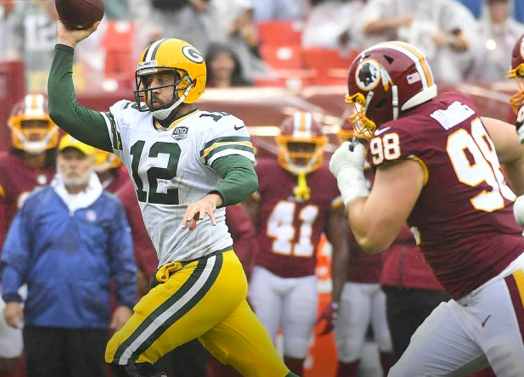 It had been a slow start for the Redskins this season in the “big play” department, however, Alex Smith torched the Packers for 214 yards in the first half alone. Adrian Peterson looked like the 2012 version of himself. Mike Pettine’s group tightened up in the second half, but it was too late. The Ugly Stuff: Another Clay Matthews penalty & Key Injuries. Next week against the Buffalo Bills is the week, right? The week when Matthews hits the quarterback and doesn’t draw a flag? The call against the Vikings was the worst, as it directly impacted the outcome of the game, whereas the one against the Redskins didn’t, but this call was equally egregious. I don’t know what else there is to say … Muhammad Wilkerson looks like he suffered a serious ankle injury, Bryan Bulaga injured his back, and Justin McCray left the game as well. It was sloppy.